We always want you to be completely happy with all your purchases from Dave's Pet & Garden Supplies. We understand that sometimes it might not be right. If you are not happy with your product and want to return it, please ensure the product is returned unused, in the original undamaged box including all original packing, original owner's manuals, warranty card and any included accessories, remote control, and/or power cords that came with the product (where applicable). We reserve the right to charge a restocking fee or refuse the return if the items are returned incomplete or damaged in any way. However, in cases where the product was shipped in our error or was considered to be faulty on arrival, the purchaser is required to pay all costs incurred with regard to shipping the product back to Dave's Pet & Garden Supplies. Please make contact with Dave's Pet & Garden Supplies and let us know about the issues concerning the order. Our contact details are - email: [email protected] or phone: +61 428 296 646. On receipt of your correspondence (Item 1. above) you will be provided a return or exchange reference number, please label and post back the items to the address: Dave's Pet & Garden Supplies, 60 Harmsworth Road Pacific Pines Qld 4216. Refund or exchange will be processed within 3 business days. Refunds will be processed using the original tender type. Credit Card refunds will be processed against the original card details (the exact card used to make the original purchase). PayPal refunds will be refunded back to the original PayPal account. Bank deposit payments will be paid back to bank account as soon as BSB and Account details are supplied to us. If you are not happy with your product and want to return it, please ensure the product has been unused, in the original undamaged box including all original packing, original owner's manuals, warranty card and any included accessories, remote control, and/or power cords that came with the product (where applicable). We reserve the right to charge a restocking fee or refuse the return if the items are incomplete or damaged in any way. However, in cases where the product was delivered to you in our error or was considered to be faulty on arrival, we will cover all costs incurred with a free pickup service. 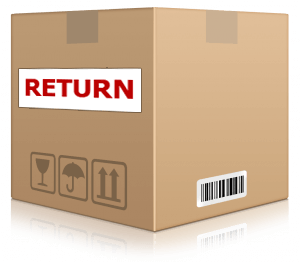 On receipt of your correspondence (Item 1. above) you will be provided a return or exchange reference number for your information. We will endeavour to collect the item within 3 business days.